Using CO2 to control the pH of your waste water, process water, and storm water will bring a range of benefits to you and your business. Fortrans, Inc. offers proprietary CO2 pH control systems that make use of harmless, cost-effective carbon dioxide to help control the pH of all types of water—even water with high amounts of dissolved and suspended solids. Our CO2 pH control systems are ideal for a variety of industrial, manufacturing, and other applications. 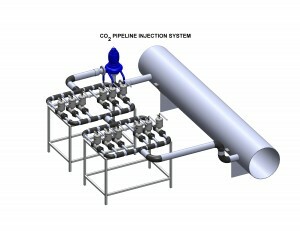 CO2 pH Control Systems from Fortrans, Inc. The Fortrans Dif-Jet is a unique, patented device developed specifically to use C02 for pH control and neutralize the pH of process and waste water at your facility. The Dif-Jet is by far the most efficient and cost-effective equipment for injecting CO2 gas into even the dirtiest, highest-solids water that results from industrial processes, concrete production, and more. The proprietary design of the Dif-Jet CO2 pH control system also makes it virtually immune to the buildup of scale and other solids, reducing the need for costly maintenance and regular downtime. CO2, or carbon dioxide, is far safer than other harmful or toxic chemicals which are used in pH control systems, such as highly-corrosive acids. In addition, CO2 for pH control is much more readily available and far easier to store and transport, making it much less expensive than other pH control chemicals. Using CO2 for pH control will save you money, time, and effort while making your process and waste water safe and legal for off-site discharge under the US Clean Water Act. The wide range of CO2-based pH control systems offered by Fortrans, Inc. will help you meet an array of needs in a variety of unique applications. To learn more about our quality, cost-effective CO2 pH control systems, we encourage you to explore the pages listed below, and be sure to contact us today to speak to one of our expert sales representatives. Also, check out all of the available 5000-system accessories for your facility’s CO2 pH control system from Fortrans. Contact Fortrans, Inc. today to discuss the CO2 pH control system needs of your facility. We are available online or by phone at 866-958-7267.